&quot;Discuss the role of feedback in teaching and learning of physical skills&quot;. 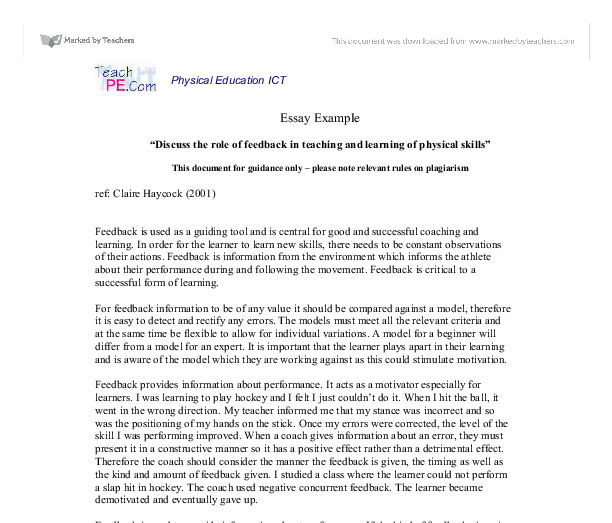 Essay Example "Discuss the role of feedback in teaching and learning of physical skills" This document for guidance only - please note relevant rules on plagiarism ref: Claire Haycock (2001) Feedback is used as a guiding tool and is central for good and successful coaching and learning. In order for the learner to learn new skills, there needs to be constant observations of their actions. Feedback is information from the environment which informs the athlete about their performance during and following the movement. Feedback is critical to a successful form of learning. For feedback information to be of any value it should be compared against a model, therefore it is easy to detect and rectify any errors. 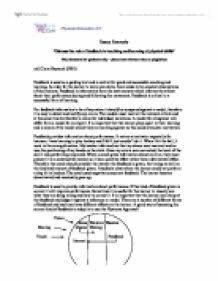 The models must meet all the relevant criteria and at the same time be flexible to allow for individual variations. A model for a beginner will differ from a model for an expert. It is important that the learner plays apart in their learning and is aware of the model which they are working against as this could stimulate motivation. Feedback provides information about performance. It acts as a motivator especially for learners. I was learning to play hockey and I felt I just couldn't do it. When I hit the ball, it went in the wrong direction. ...read more. I then progressed and put into a game situation and KR was more appropriate because the success was largely monitored by the outcome. When learning new skills, extrinsic feedback is useful from a coach or teacher as they have the knowledge about the skill, but once the learner is more confident and capable, they will be able to use intrinsic feedback where they are able to self analyse themselves. Most kinds of feedback which is used for a learner is determined by the coach and whether they feel the learner can cope with constructive criticism. Research has been conducted to prove that feedback is important. Crisfield quoted in Sharp, 1986, 'Feedback is absolutely vital. It's very difficult to evaluate your own role without external feedback. I try to give two forms of feedback, objective feedback from game analysis as well as subjective feedback from my own perceptions. I try to give players feedback on a personal basis, face to face, and if that's not possible, which sometimes in a large team game it isn't, I'm forced to give them feedback on paper. I try to give feedback as soon as possible after the game but this depends on the individual and what has happened in the game.' In some sports, feedback can be given concurrently, (throughout the game) ...read more. This is where the performer is consciously performing and adjusting to feedback. Due to this, the performance is much slower. This theory suggests that the more experienced you are, the less feedback you need compared to a learner. Another theory was made by Edward Throndike (1932). He suggested that positive feedback helps with the development of motor skills. This was the 'Law of Effect', where if a response is followed by a successful experience, then the Stimulus Response bond is strengthened and the performer becomes motivated, but if the response is negative, then the Stimulus Response bond is weakened, therefore demotivating the performer. Linking in with positive reinforcement is the long term memory (LTM). When the performer learns a new skill it automatically goes into their short term memory (STM). If the performer receives positive feedback and enjoys the skill, it will then goes into the LTM which means the performer will remember it weeks later. If the skill was being performed and receives negative feedback and it could demotivate the performer and it could be likely they wouldn't want to perform it again, therefore it would probably not enter the LTM and be forgotten. To conclude, feedback is a source of information which tells the performer the outcome of their movement. It can act in different ways and have different effects on people. Through my own experiences in sport, I find feedback very useful with the aid of guidance and I have found different sources of research which also agree. ...read more. Another possible cause is that I do not throw the ball up high enough, my coach has told me that the higher the ball is thrown, it is easier to get more spin, this is because it gives you more time to get your bat in position as the ball is on its way down. Pressure 7/10. Andrew was unable to cope with the pressure whilst batting as most shots weren't his normal controlled and powerful, however he was able to deal with it while bowling and with his aggressive bowling technique put pressure on the batsman. if the stimulus comes from the right hand side, response is faster with the right hand limbs than the left. Automaticity. The more often a stimulus is responded to, the more reaction time is reduced. E.g. the more practise a goalkeeper has in saving shots, the faster their reaction time becomes. There are many different guidance methods that can be used. These different methods can be categorised into which senses are used to retrieve the information. However, a mixture of senses is normally used by performers to receive and process information e.g. many factors that can affect them, for example the weather , the crowd , the inverted U theory according to Yerkes and Dodson (1908) which states that : * At low levels of arousal, performance will not be good, the athlete is not psyched up for the performance. Law of Readiness: This law refers to the conditions that determine what will act as satisfiers and annoyers. (2) Law of Exercise: Responses are connected to situations simply because they occur frequently in those situations (laws of use & disuse).